NORTHERN Ireland’s health and justice ministers have been urged to take action to reduce the number of stillbirths in Northern Ireland following a landmark inquest into a stillborn baby girl. In September this year an inquest heard how the Northern Health and Social Care Trust had accepted a series of failings in relation to baby Cara Rocks who was stillborn at the Causeway Hospital in Coleraine in June 2013. 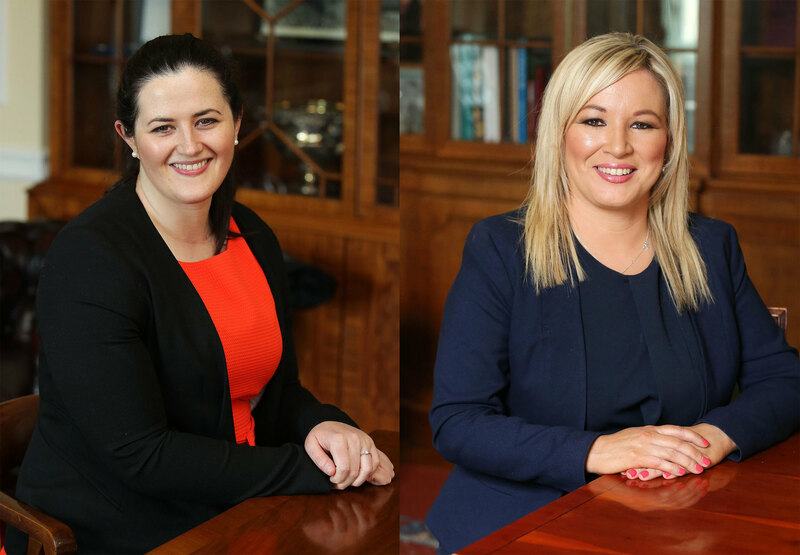 The coroner has since sent identical letters to both Health Minister Michelle O’Neill and Justice Minister Claire Sugden about the inquest. In the correspondence obtained by The Detail Belfast coroner Joe McCrisken said he believed action could be taken by both their departments to “prevent the future occurrence of stillbirth”. We can also reveal that 184 stillbirths have been referred to Northern Ireland Coroners’ Service since a legal challenge in November 2013 allowed inquests to examine why some babies die before taking their first breath. The inquest of Cara Rocks in September this year was the world's first to focus solely on a stillborn baby. In an interview with The Detail Cara’s mother Michelle Rocks said she welcomed the fact that the coroner had called for action from government and hoped improvements could be made. She said: “We heard during Cara’s inquest that there are resource issues in terms of funding research into what causes stillbirths. “It’s sad when it comes down to money because we know that there’s money been thrown at other things and at the end of the day this is babies’ lives we’re talking about. The Justice Minister Claire Sugden responded to Mr McCrisken’s letter stating that in her belief the setting up of a paediatric pathology service for Northern Ireland was a matter for the Health Minister. The Health Minister Michelle O’Neill has not yet issued a formal response. In a statement to The Detail a spokesperson for her department said it acknowledged the important issues raised by the coroner stating that the minister was giving “thorough consideration” to the matter and would be issuing a reply shortly. Solicitor for the Rocks family Lawrence McMahon from Haughey Solicitors welcomed Mr McCrisken’s correspondence. He said: “The incidence of stillbirth in this jurisdiction is a women’s health and public health issue which has not been recognised or addressed adequately by government. An unnecessary silence attaches to the issue of stillbirth. A spokesperson for the Northern Trust said: “The trust accepted the findings of the inquest and again offers its sincere sympathy and unreserved apologies to the Rocks family. "When this tragic event happened, the trust undertook a full investigation. We identified areas for learning and have implemented recommendations." Over the last ten years there was an average of 99 stillbirths per year in Northern Ireland. Until that decision, inquests did not take place into stillbirths anywhere in the UK. In December 2014 Northern Ireland’s Chief Medical Officer issued guidance to doctors on the circumstances in which stillbirths should be reported to the Coroner. It stated: “If the demise of a fetus occurs early in pregnancy, at a point when independent life is not possible, then it will not be a fetus capable of being born alive and therefore should not be reported to the coroner. Of the 184 stillbirths referred to the coroners’ service between November 2013 and August 2016, the majority of the cases were closed by a Medical Certification of Cause of Death (MCCD). This is when the coroner makes a decision to close the case based on the information provided by the reporting doctor and the reporting doctor issues a stillbirth certificate. 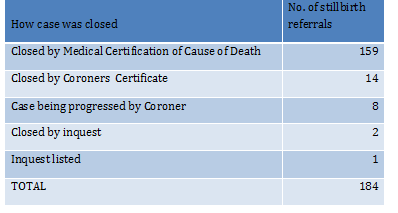 Fourteen of the cases were closed by a coroner’s certificate. This is when the coroners’ service begins to investigate the case but is satisfied that no further investigation is needed and the coroners' office notifies the registrar that the family can register the death. Two cases are listed as being closed after going to a full inquest hearing. One of these cases was the inquest of baby Cara Rocks in September this year, the first inquest to focus solely on a stillbirth. The other inquest from January 2014 examined the death of Cara Officer who was 26 weeks pregnant when she died of a rare blood disorder. Her unborn baby Ewan also died. The inquest investigated both deaths. These stillbirths could only be heard at inquest following the Court of Appeal judgment in November 2013. It ruled that an inquest could be heard into the death of stillborn baby Axel Desmond. Fifteen years after Axel Desmond was stillborn in Altnagelvin hospital and three years since the law changed, his case is still listed as being progressed by the coroner. The Detail previously spoke to Axel’s mother Siobhan Desmond about the delays in her son’s case. 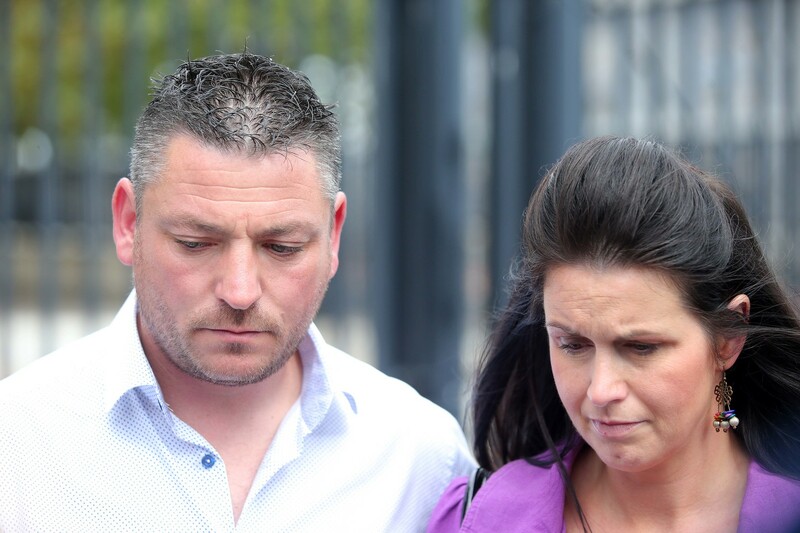 The inquest of Cara Rocks could only take place because of the court of appeal judgment on Axel Desmond and Cara’s father Barry Rocks told The Detail: “I hope Ms Desmond gets her son’s case heard as soon as possible. Cara’s mother Michelle said she was glad the law had changed so that stillbirths could be heard at inquest. She said: “It should have been happening years ago. How many wee babies have died and parents who never got answers. Cara Rocks was stillborn at the Causeway Hospital in Coleraine on June 26 2013. In September this year an inquest into her death was held, the world's first inquest to focus solely on a stillborn baby. The Northern Health and Social Care Trust accepted a series of failings and assured the coroner, Joe McCrisken, that it had implemented a number of system changes aimed at avoiding similar tragedies. During the inquest Mr McCrisken heard that despite repeated requests for an elective c-section following difficulties in her two previous pregnancies. The inquest was told that Mrs Rocks did not receive that option and had suffered from an undetectable placental defect known as delayed villous maturation (DVM), which affects the baby's oxygen levels. Concluding the inquest Mr McCrisken said he would raise the case with Stormont's Health and Justice Ministers to highlight the lack of resources available for researching placental abnormalities. The Detail has obtained a copy of the correspondence sent to both the health and justice ministers on October 10 2016. The letter sent to both ministers is identical in content. In the letter Mr McCrisken outlined that relatively little is known about DVM other than it accounts for 10% of stillbirths in Northern Ireland. Mr McCrisken queried whether resources existed to allow for further testing of both healthy and unhealthy placentas to assist in the understanding of the role played by DVM in stillbirths. In his letter said: “I consider that action could be taken by the Department of [Health/Justice] to prevent the future occurrence of stillbirth and I believe that, as Minister, you have the power to take or engage such action. In a response sent on October 24 2016, Justice Minister Claire Sugden said: “I am afraid on this occasion that I am unable to assist you, as my department does not have responsibility for the setting up of a paediatric pathology service for Northern Ireland. “Responsibility for such a service would fall, in my view, within the remit of my Executive colleague, Michelle O’Neill, as Minister of Health”. The Coroners Service confirmed that it has not yet received a response from the Health Minister. Reflecting on his daughter’s inquest, Cara’s father Barry said: “That week the inquest was on was definitely a hard week, we weren’t really sure what was going to be involved with an inquest, but we think it was worth it.